This fine antique Victorian sterling silver afternoon teaware set consists of a cream jug, a sugar bowl and pair of sugar tongs. The cream jug and sugar bowl have a circular rounded form onto a plain collet foot. The bodies of the sugar bowl and cream jug are embellished with fine and impressive bright cut engraved stylised foliate and stemmed floral decoration accented with bird motifs. The surface of the arched handle, stems and bowls of the sugar tongs are ornamented with further bright cut engraved leaf designs floral and leaf designs. The decoration to each piece incorporates a vacant shaped cartouche. The cream jug is fitted with a plain sterling silver opposing scroll handle. The interior of the cream jug and sugar bowls retain the original gilding. 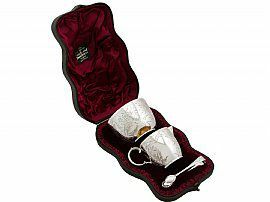 This Victorian silver cream and sugar set retains the original hinged leatherette box with satin and velvet lined interior securing with a push fit catch. The interior of the box bears the retailer’s mark ‘Estd 1798, Boodle and Dunthorne, Liverpool and Chester’. Each piece of this antique silver cream and sugar set is a very good gauge of silver, fine quality and in exceptional presentation condition. Full hallmarks struck to the surface of the cream jug, underside of the sugar bowl and interior of the tongs are all very clear. Reflections in photographs may detract from the true representation of this fine silver cream and sugar set. Length from back of handle to tip of lip 10.5cm/4.1"